Rode up to the Small Farms Conference with Margie and Nick from Bee Heaven, Gabriele from Paradise and Hani of Redland Mediterranean. 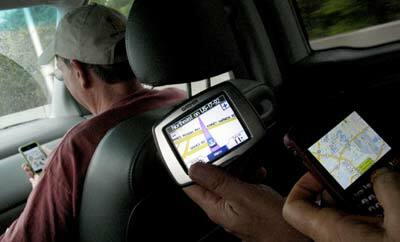 We gathered in Redland in the late morning and took a leisurely drive up US 27 to Kissimmee. that city folk would find ordinary or ignore. 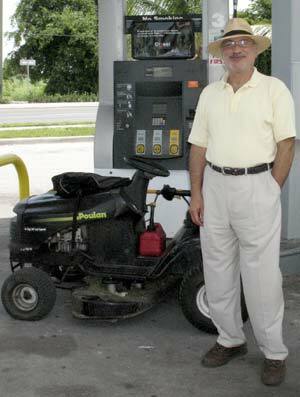 At the first stop, The Southern Belle Truck Stop in South Bay, Hani admired a rider mower at the pump. Looks like the owner just rolled right up to get gas. Didn’t know you could take those things on the road. Next, farmers know where to get good eats off the beaten track. Further down 27, Margie pulled in at Guines Ranch for homemade queso blanco made from cow’s milk. There were herds of cows and goats in the front fields. (They do sell goats for meat, in case you’re interested.) The queso was mild and squeaked a little when I chewed it. Was a good snack along with organic (not local) cherries and organic (not local) dried goldenberries. Local eats 1, not local 2. Could do better, I guess. Spotted a sign in Avon Park that said it was in South Florida, which started a discussion of how far north is South Florida, and where the line (or fuzzy boundary) is drawn. What is the criteria that determines where northern South turns into southern Central Florida. Is it climate, geography, distance? (If anybody knows, please let me know.) And, if it’s grown in Avon Park, then is it local to Miami? They’re both in South Florida! The word local — along with the words organic and natural — seems to have its definition stretched and pummeled into meaning something different than your county or immediate neighborhood.